Want to be notified of new releases in scikit-optimize/scikit-optimize? Scikit-Optimize, or skopt, is a simple and efficient library to minimize (very) expensive and noisy black-box functions. It implements several methods for sequential model-based optimization. skopt aims to be accessible and easy to use in many contexts. The library is built on top of NumPy, SciPy and Scikit-Learn. We do not perform gradient-based optimization. 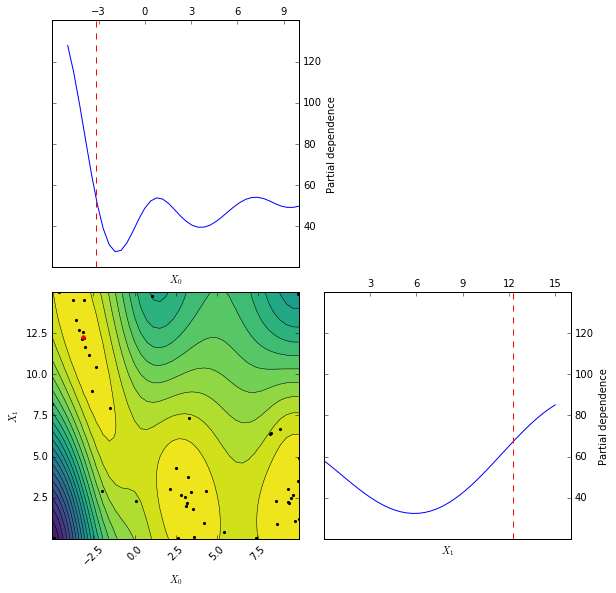 For gradient-based optimization algorithms look at scipy.optimize here. Approximated objective function after 50 iterations of gp_minimize. Plot made using skopt.plots.plot_objective. Example notebooks - can be found in the examples directory. This will install matplotlib along with scikit-optimize. Using conda-forge is probably the easiest way to install scikit-optimize on Windows. Read our introduction to bayesian optimization and the other examples. The library is still experimental and under heavy development. Checkout the next milestone for the plans for the next release or look at some easy issues to get started contributing. Run all tests by executing pytest in the top level directory. To only run the subset of tests with short run time, you can use pytest -m 'fast_test' (pytest -m 'slow_test' is also possible). To exclude all slow running tests try pytest -m 'not slow_test'. This is implemented using pytest attributes. If a tests runs longer than 1 second, it is marked as slow, else as fast. did the last build of master succeed? Before making a release we usually create a release candidate. If the next release is v0.X then the release candidate should be tagged v0.Xrc1 in setup.py and __init__.py. Mark a release candidate as a "pre-release" on GitHub when you tag it. Feel free to get in touch if you need commercial support or would like to sponsor development. Resources go towards paying for additional work by seasoned engineers and researchers. If your employer allows you to work on scikit-optimize during the day and would like recognition, feel free to add them to the "Made possible by" list.